*1st On Net* MagOne V3.5 - Magazine Blogger Template | BloggersStand ';-1!=b.indexOf("img.youtube.com")&&(a=' ');d=a+''+p+''+titlex+"
Template Options: have friendly UI for changing template options easily through Spot Settings tool. Hello, we have some great news for our regular readers. 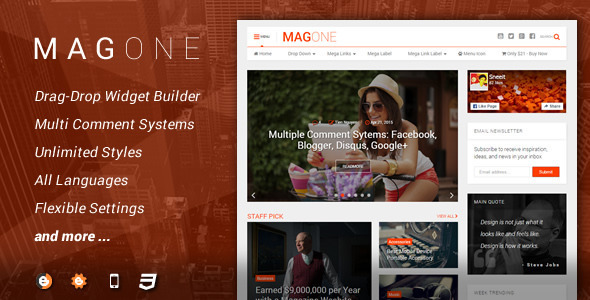 We are providing Magone 3.5 Responsive Magazine Blogger Template absolutely free. To get the template, please show support to the bloggersstand community by liking or following us on the social media. This will help us to provide an awesome experience and more facilities for our users. Just connect with us on any kind of social media and confirm the same with a comment below including your email information or you can use contact us page directly. We will send you the template as soon as we are happy with your commitment with us. So what are you waiting for, join us for an awesome blogging experience. Free Download MagOne V3.5 - Responsive Magazine Blogger Template,portfolio design, multipurpose, news paper, best blogspot theme download for free. So Far 31 Comments on "*1st On Net* MagOne V3.5 - Magazine Blogger Template" - Post Yours! Hello Miftachul Huda..Did you completed above step ? what we have written in note? and also following your facebook page since the very first time i visited your website. Hello Aiden Raw will you confirm your username..Sorry not able to recognize you..:( as soon you will confirm and we will cross check it..and will send after that..hope you understand why we are doing this..it's for you and for our readers to provide better facility service to you..
Will You please confirm once again ? Anyways We trust you and your words..hope you have followed...We are going to send you template now..Check your inbox now..Enjoy!! If you have not joined us on facebook kindly join us. Hello Serius Gue Thanks For Joining us...Hope you understand why we have done this..Kindly check We have sent Magone V3.5 Magazine Blogger Template In your Inbox. and Do share our website with your friends. :) Enjoy ! Hello Drhelol Ahmed just give us some time let us confirm your username on social media profile..Till then Stay tuned...will confirm and post the updates with you..Thank you ! Hello Drhelol Ahmed sorry we are not able to find your username..it will be more greatful if you comment on any post we have shared on facebook so we can recognize you. Hello Nikos..We would love to share magone v3.5 with you but first let me know ,did you have completed above steps what we have mentioned in notice ? If yes can you please confirm your social media username so we can cross check asap and provide you blogger template. My username on facebook is nikolake and i liked and follow bloggers stand. I have nothing in my email teel now. Hello Nikos,I think before you have provided us different email id..well we have sent the template againe on nikolake@hotmail.com kindly check your email and let us know. You are Most Welcome..Keep visiting For More Premium Blogger Templates and Tricks..Stay Tuned !! I've just shared your site link on my G+ wall, and I'm also following you on G+. My Google Plus ID is plus.google.com/112090683558338050365, please check. Thank you! Hello Chung We have already sent you magone V.3.5 Kindly check your email.